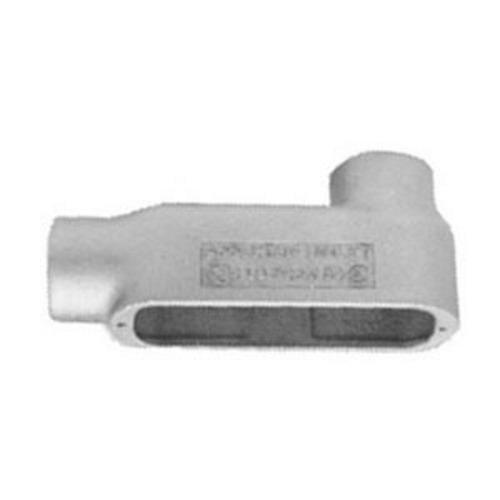 Appleton Unilets® Type LB Form 35 conduit outlet body of trade size 3-1/2-inches, is suitable for use with rigid steel, rigid aluminum and IMC conduit. It features malleable iron construction and triple coat finish. It measures 16.5-Inch x 6.81-Inch. This 2-Hub conduit outlet body with threaded connection, features domed 1/2 - 3-Inch blank covers for extra wiring space. The smooth, rounded integral bushings in hubs of this conduit outlet body protect conductor insulation. Conduit outlet body with screw-on cover, provides back access to conductors for maintenance and future system changes. Conduit outlet body is UL listed and CSA certified.